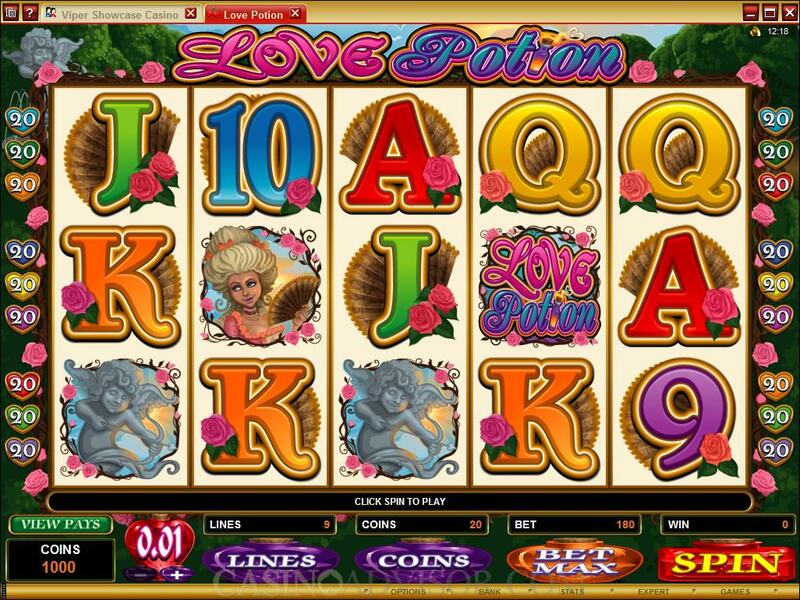 Love Potion is a Valentine’s Day themed slot game from Microgaming. It takes players to the old times when there was etiquette in wooing. The styling of the symbols reflects the charm of those days. The payline indicators are heart shaped and the game operating buttons are bottles of love potion. The Love Potion in the ornate heart shaped bottle is the bonus symbol. The Carriage that transports the lovers to their liaison is the scatter symbol. The Love Potion Logo is the wild symbol. The Lady, the Gentleman and Cupid are the other thematic symbols. High value card symbols embellished with roses also grace the reels. Love Potion has only 9 paylines. 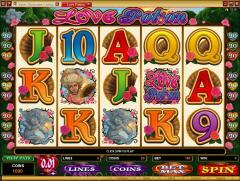 Therefore payouts are less frequent and the player has to be patient with this slot game. 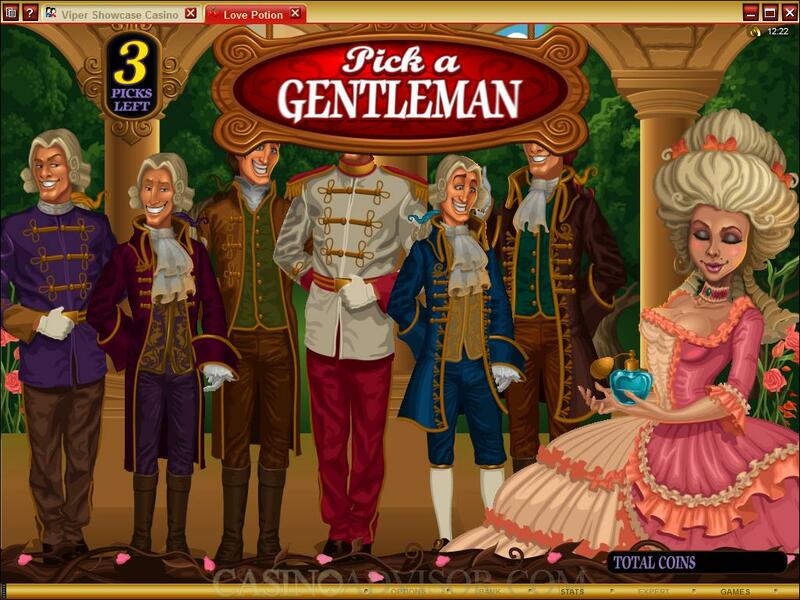 The player can wager up to 20 coins per line and the coin size varies from 0.01 to 0.25. The maximum line bet is 5.00 credits and the maximum total bet is 45.00 credits. The Love Potion is the bonus symbol. When two or more of these symbols appear left to right on enabled paylines they offer scatter payouts, which are multiplied by total bet to convert to credits. They also trigger the Love Struck Bonus round. The number of picks in the bonus round is equal to the number of bonus symbols that trigger the round. In the Love Struck Bonus round the player chooses the appropriate number of gentlemen from those standing in the line. Each then come to the lady in turn. The lady sprays the love potion on herself and blows kisses to the gentleman. He presents her with a bouquet of roses displaying the number of bonus credits and then leaves love struck. The Carriage is the scatter symbol. Two or more Carriage symbols appearing anywhere on the reels result in scatter payouts, which are multiplied by total bet to convert to credits. Three or more scatter symbols appearing anywhere on the reels offer 10 free spins with a 5x multiplier. The free spins can be retriggered and the bonus game can be triggered during the free spins. Love Potion also has a Gamble Game. After each win players have the option of staking their payouts in the Gamble Game. In the Gamble Game players can try to double the payout by choosing the color of the next card from red and black or they can try to quadruple their payouts by choosing the suit of the next card. A correct guess will result in doubled or quadrupled payouts and a wrong guess will end in the player losing his staked amount. The Gamble Game can be replayed till the gamble limit is reached. Interested in reading more detailed information about Love Potion? If so Click Here for more details.